Reactive or Proactive Health Choices? In today’s fast paced society, sometimes it’s easy to lose track of your health and wellness goals. In some cases, some people don’t take their health seriously until something extreme occurs, like a heart attack or cancer. To be healthy and stay healthy you must be proactive versus reactive. If you find yourself rushing to the doctor’s office or pharmacy once a symptom or pain appears, that’s being reactive. In most cases, by the time the symptom appears, the underlying problem has already been developing. Taking the proactive approach to your health and wellness puts you in charge and empowers you to make the right choices for your health and wellness way ahead of time. Keeping your spine and nervous system optimized with chiropractic care. Exercise regularly. Minimum 3 times / week. Eat wholesome, natural, nutritious foods. Manage your stress and overwhelm. Create a vision for your life along with well-rounded goals. These 5 pillars to great health form the foundation to the wellness model taught at Back To Health Chiropractic Centre. You can read more about each pillar through the various articles on our website. Choose wisely today. Your health, your happiness and your quality of life depends on it. 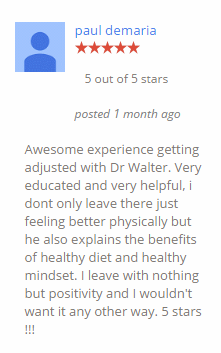 Posted in City Vaughan chiropractic clinic, Dr. Walter Salubro, Goals & Vision, Town of Maple chiropractic clinic, Wellness | Comments Off on Reactive or Proactive Health Choices?